You can also download the entire The Comedy of Errors translation as a PDF! Egeon tells the story of how his family was separated years ago. He'll be executed if he can't pay the ransom. Syracusian Antipholus arrives with servant Dromio in Ephesus. 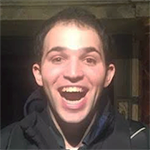 Dromio's identical twin thinks Antipholus is his master. Adriana laments her husband's inattention. Dromio of Ephesus explains to her how crazy his master has been acting. More confusion abounds over mistaken identities. Adriana brings the wrong Antipholus home for lunch. Antipholus and Dromio of Ephesus get locked out of their house since Antipholus of Syracuse is already dining inside. Antipholus of Syracuse pursues Luciana (Adriana's sister) to her horror. Dromio of Syracuse deals with his twin's wife. A chain that Dromio of Ephesus has purchased ends up in the wrong hands, so he gets arrested for theft. Luciana tells Adriana of her "husband"'s improprieties. Dromio of Syracuse reports the arrest and Adriana sends money. More mistaken identities, this time involving a prostitute. Antipholus of Syracuse hopes to escape Ephesus for good. Antipholus of Ephesus tries to clear things up, but he only throws everyone into deeper confusion. All is made clear, Egeon's ransom is paid, and a local abbess turns out to be the mother of the Antipholus brothers. Rubins, Dan. "The Comedy of Errors Translation." LitCharts. LitCharts LLC, 11 May 2014. Web. 25 Apr 2019. Rubins, Dan. "The Comedy of Errors Translation." LitCharts LLC, May 11, 2014. 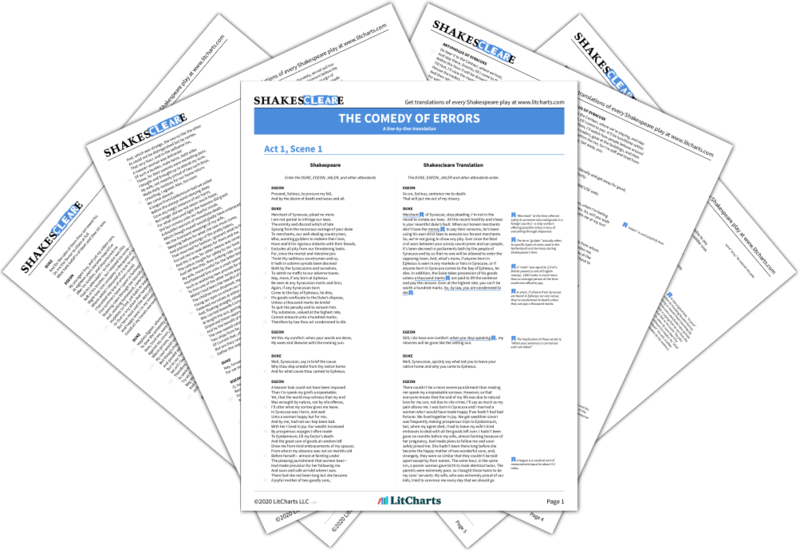 Retrieved April 25, 2019. https://www.litcharts.com/shakescleare/shakespeare-translations/the-comedy-of-errors.